Ectopic pregnancy is also known as eccysis, is a pregnancy complication in which the egg implants outside the uterus. This condition cannot be corrected by relocating the wrongly implanted embryo into the uterine cavity. Furthermore, it is fatal since internal haemorrhage is a life threatening condition. If this is not treated properly, it can lead to death. So what you should do avoid the complications? Making a research means you have to know the physiology and symptoms of the problem. In this pregnancy problem, the embryo develops outside a woman's uterus and usually implants itself in the fallopian tube (also known as tubal pregnancy). Tubal pregnancy can lead to intra-abdominal haemorrhage which becomes a very serious complication when the tube ruptures. 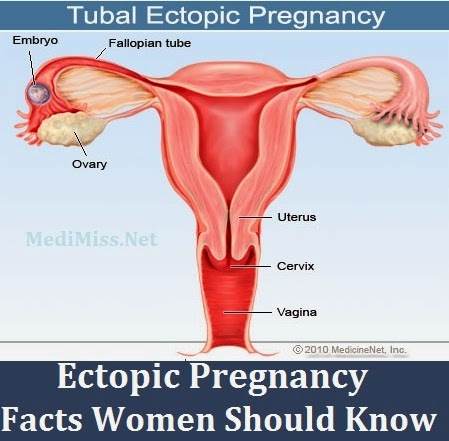 According to statistics, ectopic pregnancy occurs in about 1 out of 200 pregnancies. This condition is very serious because when the embryo grows in the fallopian tube, it grows continually until it would rupture the tube causing severe bleeding. As a result, it can result to inability to conceive or even death. If you had previous fallopian tube infections (salpingitis) such as pelvic inflammatory disease (PID), Chlamydia, and gonorrhoea, you are most likely predisposed to this pregnancy condition. Other precipitating factors include previous abdominal surgery, tumours or cysts in the tubes, fibroids in the uterus, endometriosis, use of fertility medication during conception, use of intrauterine device (IUD) and history of tubal pregnancy. Symptoms may include diarrhoea, light-headedness, paleness, lower back pain, and abdominal pain. The symptoms of ectopic pregnancy are more or less the same as normal pregnancy. Although these early pregnancy symptoms do not always mean there is something wrong with the pregnancy, it is best if you report this to your doctor. Prevention is better than cure. A woman who suffered from ectopic pregnancy might stand poorer chances of conceiving again. So be cautious and talk to your doctor about this matter. The option for treatment depends on the severity of the condition. Ectopic pregnancy starts out not ruptured. However, if left untreated for too long, the embryo will continue to grow until it ruptures the fallopian tube. All of the options available for this condition are a form of abortion. If the tube has not ruptured, laparoscopy may be performed. If not, surgical treatment may be needed. Salpingiostomy - This procedure involves removal of the part of the fallopian tube that was ruptured by the embryo. This is done to preserve to whole tube which enables subsequent conception. Salpingectomy - This procedure involves the removal of the whole side of the fallopian tube where the ectopic occurred. This is the last option for most doctors as it decreases the ability of a woman to conceive.